Two ships collide in a European port causing a barrel with unknown, potentially dangerous chemicals to fall aboard. A Border Guard Patrol vessel arrives to investigate the situation. Specially equipped divers are needed to recover the barrel safely and the neighbouring country’s authorities are contacted for assistance. A vessel from the neighbouring country’s coast guard arrives shortly, carrying a team of divers, while a decontamination station is being set up on the shore to clean the crew and the divers of any chemical residue. This fictional (but very possible) scenario is going to unfold in Tallinn’s Seaplane harbour in front of a large audience on the 5th of June 2018 as a short demonstration of how joint international exercises can improve countries’ preparedness for all sorts of hazards and prevent loss of lives and money. The audience will have an opportunity to see all the manouvers of the vessels and divers, professionally narrated and explained, followed up by a Q&A session. it’s an unique chance for the audience to see such exercise. The demonstration is organised within the 9th Annual Forum of the European Strategy for the Baltic Sea Region (EUSBSR) which takes place in Tallinn, Estonia on 4-5th of June 2018. EUSBSR is an agreement between the Member States of the EU and the European Commission to strengthen cooperation between the countries bordering the Baltic Sea in order to deal with common, transboundary issues. Its focus is on joint problem-solving through organised actions, processes, projects, exercises which can help, among other issues, cleaning up our polluted sea, mitigating against the effects of climate change, fighting cross-border crime and building countries’ risks resilience. The demonstration is a result of cooperation between two Policy Areas within the EUSBSR: Policy Area Secure, coordinated by the Council of the Baltic Sea States (CBSS) Secretariat and the Swedish Civil Contingencies Agency (MSB) and Policy Area Safe, coordinated by the Finnish Transport Safety Agency (Trafi) and the Danish Maritime Authority (DMA). Such a complex undertaking was made possible thanks to the common efforts of several organisations, agencies, projects and individual experts from the whole Baltic Sea Region: Estonian Rescue Board and Estonian Police and Border Guard Board and port authorities, Estonian Ministry of Foreign Affairs, Finnish Border Guard and Swedish Coast Guard, as well as EU projects ChemSAR, HAZARD and DiveSMART Baltic. 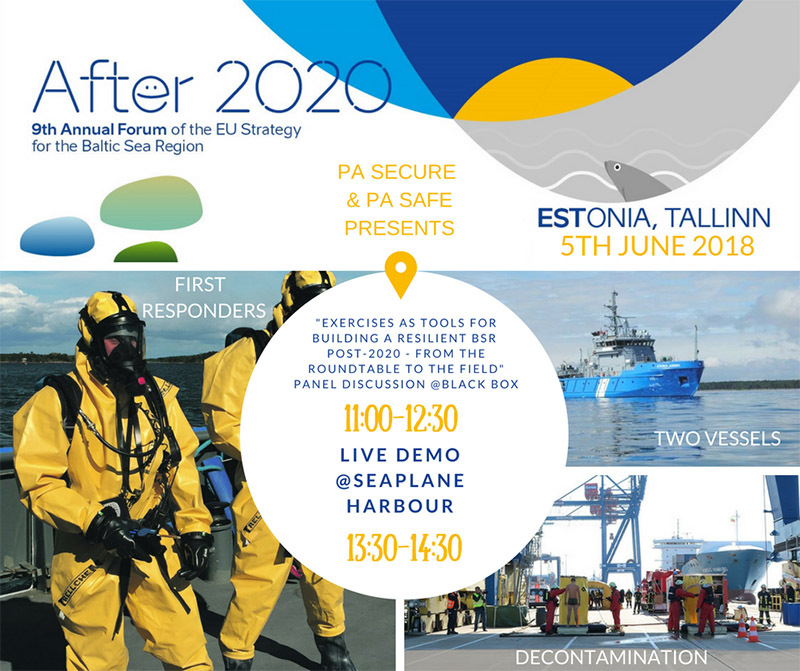 This practical demonstration with two operational vessels, a team of divers and a decontamination station will be a continuation and an illustration of the theoretical panel discussion at the Annual Forum’s venue (Creative Hub/Kultuurikatel). The panel will focus on the life-cycle of exercises, from the identification of the problems to be addressed to the logistics and evaluation, as well as on how the results of joint exercises can be used efficiently to improve practice. The panel discussion will be opened by the Municipal Mayor of Viimsi Municipality Siim Kallas, Former Vice-President of the European Commission and Former Prime Minister of Estonia, and will include prominent experts, researchers and practitioners from the region.